Somehow, when I have a secret pal to send gifts to, I get these crazy ideas about making something really cool that I probably wouldn’t normally invest the time in. Like my first (and last… so far anyway, LOL) handmade hook case, for Michelle. This time, for Crochetville Spring Secret Pals, I embarked upon a zippered, lined pouch for my pal, Heather. Hmm, I see a trend in these ambitious projects… sewing! At which I am quite amateur! 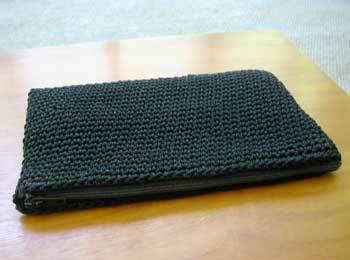 No pattern, I just crocheted a rectangular pouch (all sc, in the round) to fit the 7-inch all-purpose zipper I bought. I machine sewed the zipper as far as I could, but had to do some hand sewing at the ends. 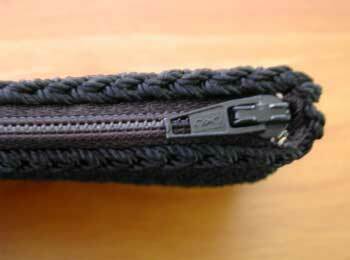 I machine sewed the seams for the lining, and sewed it into the crocheted pouch by hand. (I used a layer of black fabric on the outside of the blue lining so the light blue wouldn’t show through the crochet stitches. I love that bag! I wish I was your secret pal. :) Can we pretend?? Your stitching looks great! Thank you so much for this GREAT idea. I have made two of these in the last week, and got an extra hunk of the lining material to sew one of those little tie belts that seem to be so popular right now. You’re a very talented person, and thanks for sharing your idea! I love these and I plan to make many more! That’s really cool! Lucky Heather. What fabulous work; thank you for sharing photos and notes with us! Beautifully placed zipper, very tidy and beautiful lining. SNAP! 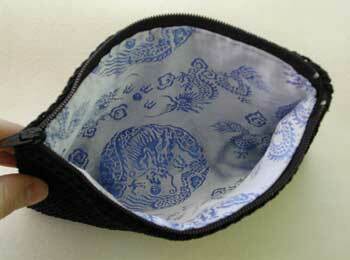 Wonderful pouch. It’s bags like that that make me want to crochet, even though I am currently horrible at it. What kind of yarn did you use? Your pouch is BEAUTIFUL!! Awesome job!